My PhD (and a subsequent short-term postdoctoral position) was funded by the VUELCO project, whose main aim was to improve the understanding of the origin, nature and significance of volcanic unrest. This should lead to enhanced monitoring and better interpretation of geophysical and geochemical signals, to enable more reliable identification of eruption precursors. Such information is essential for decision makers and civil authorities during volcanic crises to allow for improved eruption forecasting, risk reduction and hazard management. An example model geometry with boundary conditions. I have incorporated these additional model components into both forward and inverse Finite Element models using COMSOL Multiphysics. 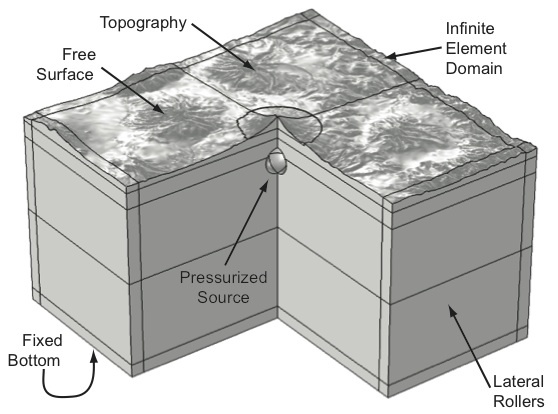 Paper (Open-access): Hickey, J., & Gottsmann, J. Benchmarking and developing numerical Finite Element models of volcanic deformation. Journal of Volcanology and Geothermal Research, 280, 126–130. To assess the importance of these various features I have applied the models to three case-study volcanoes (and am always on the look out for other deforming volcanoes to further test my approach). This study focused on the driving mechanism behind a 70 km wide region of ground uplift centred on Uturuncu volcano, in the Altiplano-Puna region of southern Bolivia. It was carried out as part of the PLUTONS project. I conducted a series of forward models using finite element analysis to test for first-order parameters to constrain a viable model for the observed maximum line of sight uplift rate of 1–2 cm/yr between 1992 and 2006. 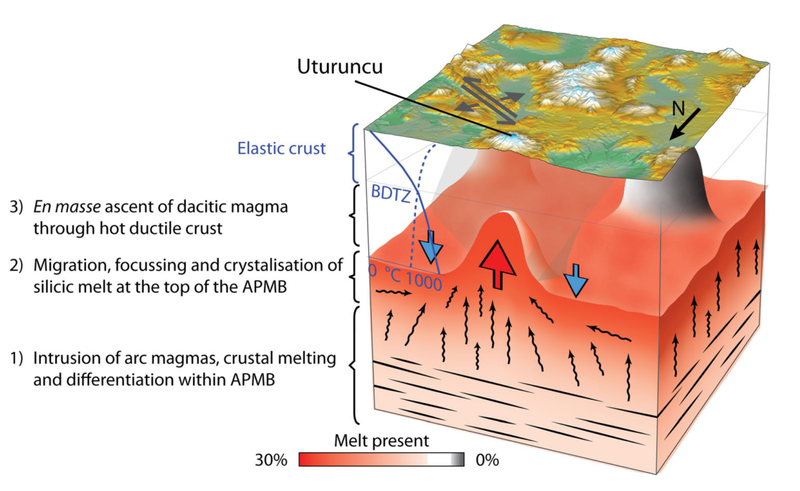 The preferred model suggests that pressurisation of a magma source extending upward from the Altiplano-Puna magma body (like a magmatic diapir) is causing the observed surface uplift. Paper: Hickey, J., Gottsmann, J., & del Potro, R. (2013) The large-scale surface uplift in the Altiplano-Puna region of Bolivia: A parametric study of source characteristics and crustal rheology using finite element analysis. Geochemistry, Geophysics, Geosystems, 14(3), 540–555. A schematic illustration of the mechanism of magma migration and buoyant ascent at Uturuncu volcano. APMB = Altiplano Puna Magma Body. Figure taken from Del Potro et al. (2013), ‘Diapiric ascent of silicic magma beneath the Bolivian Altiplano’, Geophysical Research Letters, 40, pp. 2044-2048. This work was conducted in collaboration with the Instituto Geofisico in Ecuador. It was focused on a period of unrest in 2001 and 2002 that did not lead to an eruption. I used the patterns of deformation and seismicity to constrain the cause of the unrest. I then used these results to elucidate the signals that might be expected in the future if the volcano transitions into another unrest period that might be a prelude to a forthcoming eruption. Paper (open access): Hickey, J., Gottsmann, J., & Mothes, P. (2015) Estimating volcanic deformation source parameters with a finite element inversion: The 2001–2002 unrest at Cotopaxi volcano, Ecuador. Journal of Geophysical Research: Solid Earth, 120(3), 1473-1486. An overview of the cause of the 2001-2002 unrest at Cotopaxi volcano. Low-rate, aseismic magma supply to a small reservoir in the SW caused the surface deformation, while migration of fluids from the SW to the NE along faults caused the seismicity. After seeing this volcano erupt while in attendance at the IAVCEI conference in July of 2013 I knew it was always going to be one of my favourites. It soon became a case study for the models I was developing. In collaboration with the Sakurajima Volcano Research Centre in Japan, I tested how the incremental addition of extra model complexities can alter model results. The results were clear: the incorporation of additional geophysical and geological data massively improved the model results. Interpretation of the results showed that Sakurajima might be building towards a large eruption – similar in scale to an eruption there in 1914 that killed 58 people. Paper (open-access): Hickey, J., Gottsmann, J., Nakamichi, H., & Iguchi, M. (2016) Thermomechanical controls on magma supply and volcanic deformation: application to Aira caldera, Japan. Scientific Reports, 6, 32691. You can also read the press release and selected media coverage (Guardian, Daily Mail, Live Science). A 3D thermomechanical model predicting the ground surface uplift from the build up of magma in the subsurface. Model results match the temporal evolution of the GPS results.